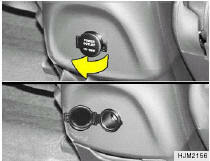 These are located in the quarter trim and on the rear main console. These supply 12V electric power to operate electric accessories or equipment only when the key is in the "ON" or "ACC" position. o Use when the engine is running and remove a plug from the power outlet after using the electric appliance. Using when the engine stops or remaining the electric appliance with plugged in for many hours may cause the battery to be discharged.